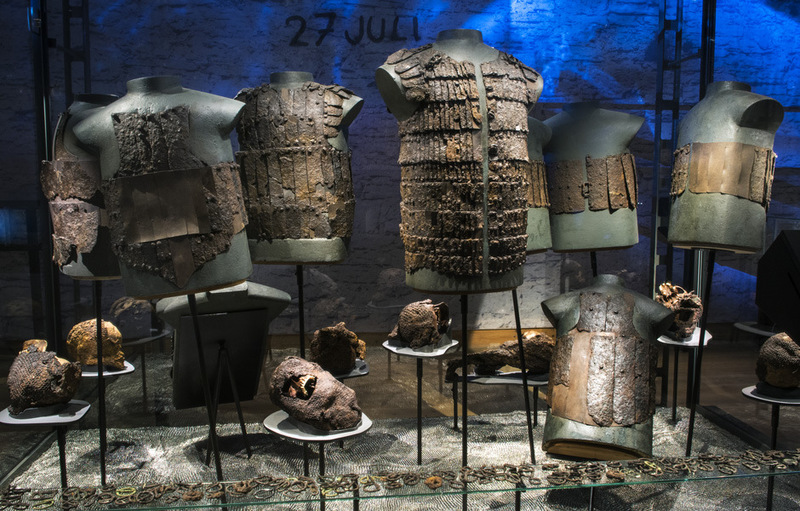 With the help of unique objects and newly achieved knowledge the exhibition “Medieval Massacre – the Battle of Gotland 1361” tell the story about a horrifying medieval battle between the farmers of Gotland and the well trained soldiers of the Danish army. It was at the end of July 1361 that 1,800 Gotland farmers lost their lives in a brutal clash with Danish troops under King Valdemar Atterdag. He was intent on subjugating Gotland after conquering parts of Skåne and Öland. He had now landed on the island with a professional army and was preparing to march on Visby. Part way there, in the marshlands of Mästerby, the Gotland farmers tried, unsuccessfully, to halt his advance. Bits of weapons, lost horse shoes and battered fragments of armour from the action are on display here. You will find the exhibition Medieval Massacre on the first floor. The last battle was fought beneath the Visby town wall. Both children and old people among Gotland’s farming population had joined in the defence of their island. Visby was forced to surrender on 29th of July. King Valdemar was victorious, and more than half the farmers of Gotland had been killed in battle. Valdemar’s son Kristoffer served with the Danish army, and his reconstructed armour and accoutrements are pictured here. The dead soldiers and their equipment were swiftly buried in large mass graves after the battle. The remains of the dead, the armour and the weapons are internationally unique in the sense of so much remaining in a state of preservation when archaeologists excavated the site in the 1920s. Items on display include mail shirts (hauberks) and coifs (headgear), chain mail gauntlets, maces, swords, crossbows and arrowheads. Together, the artefact finds and human remains give us an insight into the nature of medieval warfare. In this exhibition you can follow the progress of three Gotlanders and two Danish soldiers. New findings are presented about their living conditions. Diseases, height, build and age are some of the things which can be detected by analysing their skeletons. From injuries and bone incisions we can also reconstruct fighting techniques and identify the weapons used, just as in a modern crime scene investigation. The soldiers’ armour presents modern but also antiquated features by the standards of the time. It looks heavy to wear, but the mobility of the plates in relation to each other made it easy to move about in. There are reconstructions of the soldiers’ gear which you can touch or try on. 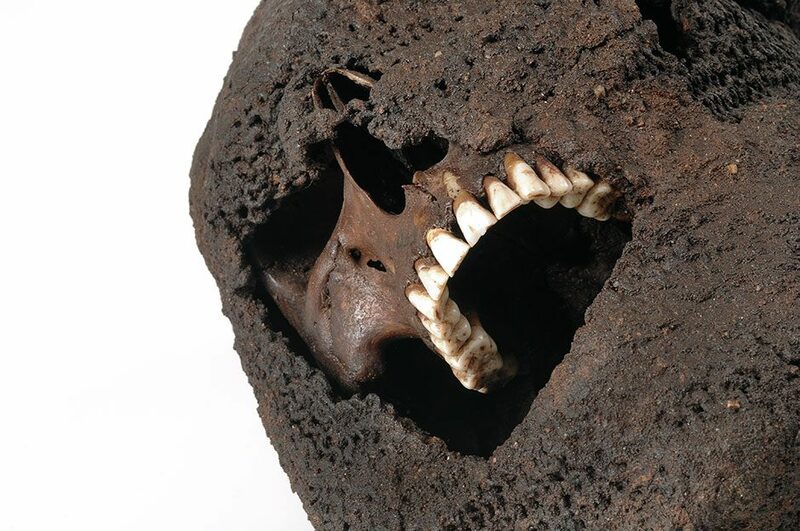 Skull of a young man, probably from Denmark. The chain-mail hook remains in position. One of the armours on display may have belonged to Bavo or Schelto Roorda. They were two brothers of a noble family in what we now call the Netherlands. We don’t know how they fared. The different bronze heraldic emblems on the armour represent different branches of the clan. A leather pouch containing a small fortune in coins was found together with another soldier who probably served in Valdemar’s army. Take a look also at the young, quite heavily built Gotlander, aged between 30 and 35. 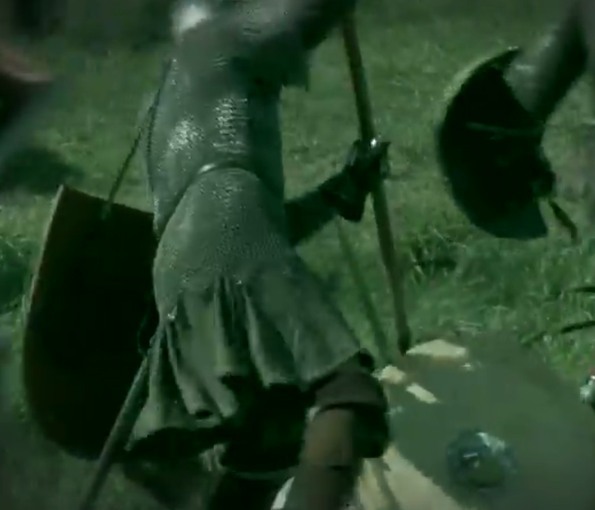 He was probably attacked from behind, sustaining several blows to the head from both axe and mace. 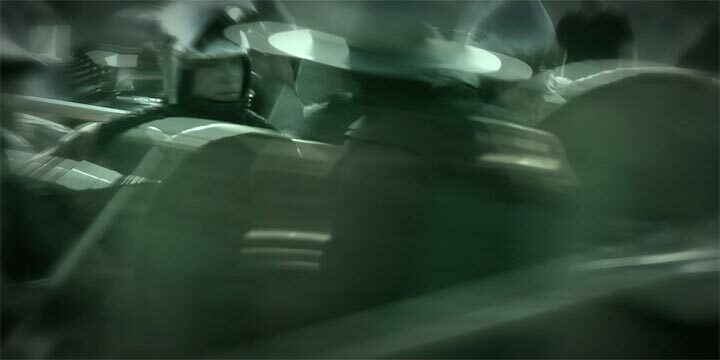 This exhibition gives us an opportunity of pondering war in a historical perspective. The battle beneath the town wall demonstrates that acts of violence and war are recurrent, destructive phenomena through the ages. The strikingly well-preserved skeletons, the photographs of mass graves, and the weapons on display here remind us of acts of cruelty occurring in the present. Children and sensitive adults may find some parts of this exhibition frightening. All finds originate from the Visby town wall in 1361 unless otherwise indicated. 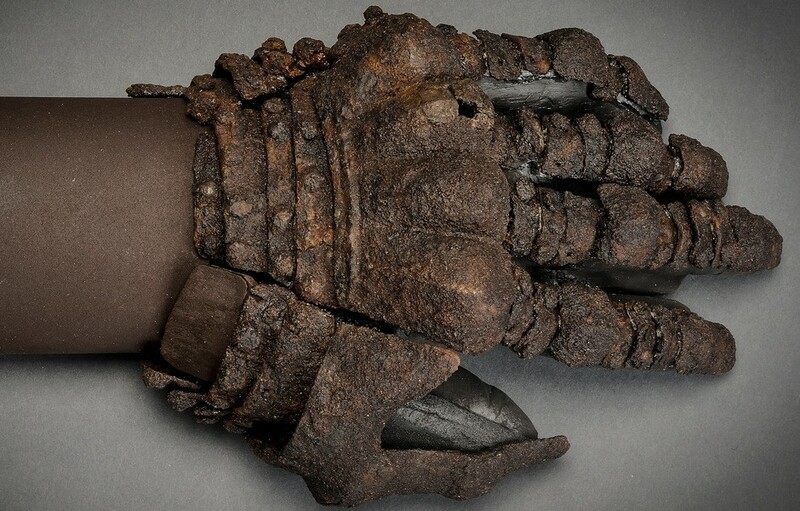 Armoured glove, from the mass graves, Visby. Photo: Gabriel Hildebrand. Texts, photos and videos from the exhibition are available through your smartphone, tablet or computer. 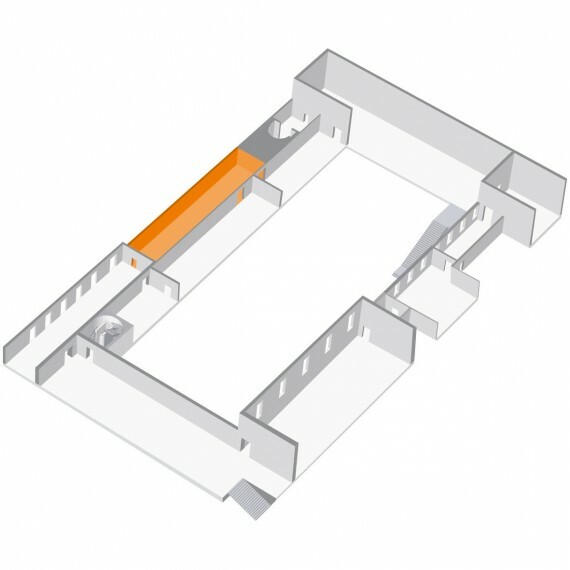 The application is primarily designed to be used in the digital touchscreens at the exhibition. We hope that you may still enjoy viewing the material via your phone, tablet or computer. The address is http://massakern.historiska.se/?lang=en. The application does not support Microsoft Internet Explorer. Please use another browser, Firefox, Chrome or Safari (for Apple products).